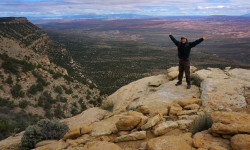 50-Mile Mountain – Across Utah! The video from my 20-day, 320-mile trek from Zion to Capitol Reef from earlier this spring. If you prefer to just see the highlights, there’s also the up-tempo short version with music (7+ minutes). And, If you haven’t already, check out the full trip report.